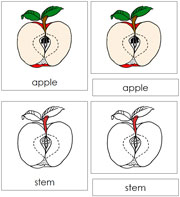 Describes 7 parts of an apple. 7 Parts of an apple in 3-part cards, includes black-line master. Describes 15 parts of a banana. 15 Parts of a banana in 3-part cards, includes black-line masters. Describes 11 parts of a banana plant. 11 Parts of a banana plant in 3-part cards, includes black-line master. Describes 6 parts of a bean seed. 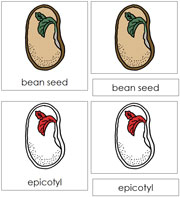 6 Parts of a bean seed in 3-part cards, includes black-line master. 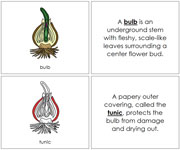 Describes 7 parts of a bulb. 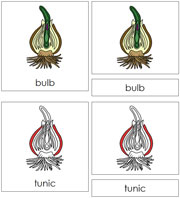 7 Parts of a bulb in 3-part cards, includes black-line master. Describes 11 parts of a corn seed. 11 Parts of a corn seed in 3-part cards, includes black-line master.